Thank you for your interest in Modular Belt Conveyor Bends And Curves. We will be happy to discuss the pricing in more detail with you please fill in your details below and somebody will contcat you back with a quote. Alternatively please call us on 01772 690656 and please reference our part number - Modular Belt Conveyor Bends and Curves. Modular Plastic Belt Based Conveyor Bends Constant control and orientation of product when turning Modular belt conveyor bends. 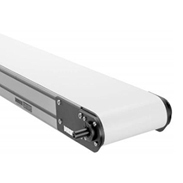 Modular belt conveyor bends are suitable for various industries. These modular bends minimise maintenance, and are more durable generally than PVC belts. With a variety of belt types available, these conveyors are constructed for high-speed applications with conical support rollers. Details coming soon, meanwhile if you are looking for a conveyor bend or curve give us a call or e-mail us.